Engine Rootes 6 cyl petrol 90 hp 11.40 bgp power/ton. Engine and radiator rear mounted. Speed 72 km/h front and back. Length 3.83 m, Width1.95 m,heigth 1.88 m.
Suspension fully independent all weels,coils and shocks. AEC Mk III Armoured Car Produced from 1942–1943. Armor frontal 65 mm , well sloped having an effective thickness of 90 mm, bottom and side 16 mm. Guns First QF 6 pounder,second ROQF 75 mm. Mass 11,6 tons,lenght 4.93 m,width 2.54 m,height 2.39 m .Crew 3 (driver, commander, gunner(is the loader too). Armor hull was made of welded steel plates,13 mm thick on the sides to 32 mm on the front glacis plate. Armament HE, AP and HESH rounds. Guns First OQF 2 pounder,second 76 mm L5A1,and the last/optional ROF 76mm L23A1 low-pressure gun. Suspension 6×6 Independant torsion bars ,and upper and lower link bars.Double hidro shocks. Development of the Fox began in 1965 and in 1967 the first car was completed.Production starts in 1972. Mass 6.75 tons normal and fully loaded 7.44tons. Lenght 5.08 m,Width 2.13 m,Height 2.20 m.
Armor Hull aluminium 15/18/18,turret 18/18/15 aluminium. Gun L21 RARDEN cannon ,Had clips of 3 rounds each, 33 such clips were carried. coupled to a David brown pre-select gearbox giving 5 forward and 5 reverse gears a top speed of 104 kph. Suspension and running gear 4X4 and wishbone type independent suspension with each wheel having a coil spring and hydraulic shock damper. 11.00x20 tires are the run flat type. Edited by ZDN, 02 February 2019 - 02:37 PM. why these cars are needed here???????? To be honest, the Brits need both a wheeled line and a light tank line. 76 mm at tier 9 and 30 mm at tier 10, this shows how compatible these vehicles are with WOT! Post war soviet vehicles also never mounted a gun bigger than the 30 mm 2A42 and most of the time mounted the 14.5 mm which was a heavy machine gun actually. Edited by XxKuzkina_MatxX, 02 February 2019 - 03:39 PM. A 7.62 machine gun at tier 7? There are numerous American produced wheeled vehicles supplied to the UK that the US never used like the T17 which started life with a 37mm but then, with various turrets like the Crusaders sported 6pdrs and even a 3" howitzer. Somewhere down the line, it had a 47mm Pak 41 stuck in it. There was a T18, which while ordered by the UK, was cancelled after the first batch arrived and was armed with a 57mm. They had great names too like Staghound, Boarhound and the like. Anyhow, I think wheeled vehicles are an ideal way to get a British lights into the game. Coventry armoured car with a 2pdr and later a 75mm. Daimler armoured car which had the Little John enhanced 2pdrs. Marmon Herrington with a 2pdr and later the 6 pdr. Edited by Blubba, 02 February 2019 - 03:47 PM. Can we give the Brits a high tier light line first before we focus on wheels? I know they have plenty to take from. But personally I'm more keen on a proper high tier scout before we get a half blind fast wheeled tank. Edited by Balc0ra, 02 February 2019 - 03:38 PM. Yes i was wondering the same as the Matilda has been re jigged in the tech tree and now can also research the Crusader WG hinted at another low tiered wheeled vehicle line, maybe this might be it! They have said they have researched the possibilities for wheeled tanks on other nations. Inc UK. But if that is this year, or if ever remains to be seen. Don't wanna spam posts, but too lazy to edit... I hope if a brit light line arrives, that we finnaly get a tier II british verison of the tetrarch. 1. I would like a full light tank line for the UK first (and even that has problems at tiers IX and X). 2. The British made lots of different armoured cars, and as mentioned used and modified quite a few USA ones. I suspect the problem will come at the mid tiers with the guns. 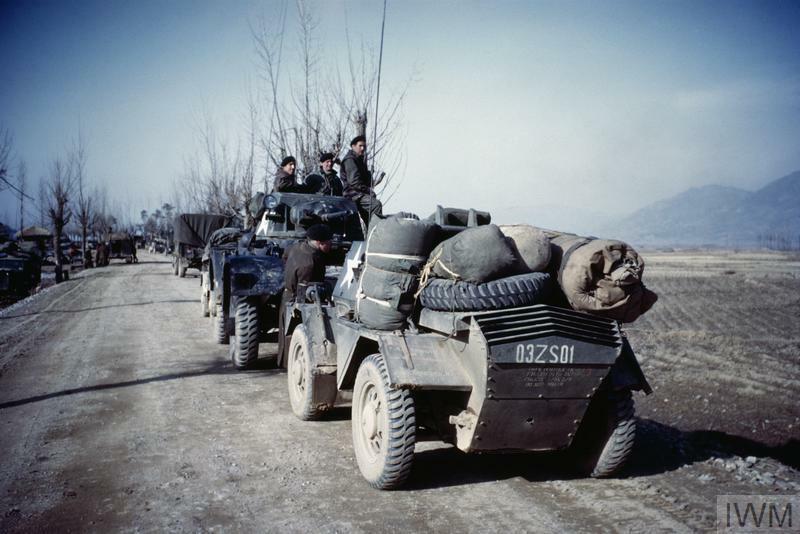 Having said that, these are historic armoured cars fielded in large numbers in conflicts all over the world by UK forces. (I believe the picture below represents UK units in Korea). Edited by arthurwellsley, 02 February 2019 - 05:04 PM. I Disagree. The Tier 9 could simple be the Scorpion 90 and it wouldn't surprise me when WG simple push an 105mm Gun in the Scorpion Turret for the Tier 10. Mid and high tiers are problematic as you mentioned. The Vickers prototypes 45569, 46200 and 51025 were too big for a light tank at least in this game but they don't have to add impossible designs just to reach tier 10! Edited by XxKuzkina_MatxX, 02 February 2019 - 06:15 PM. I will not accept a British wheeled vehicle branch without the Reliant Robin. Really Scorpion at tier 9 and Scimitar at tier 10 (choice of Rarden and 90mm gun), seems simple enough for me. Development prototype at tier 8 with Sabre as tier 8 Premium. What about they fix the many many issues of the game first to make it borderline fun to play again? THEN we can add more stuff. Should have the rolls royce armoured car, just cos it looks cool. But it is fun to play? If it isn't, why do you play?